This Korean jacket was donated to the Museum by Yi Yong-hui, whose shop 'Hanall' in Seoul produces traditional Korean costumes, as advertised on the label. It forms part of a matching bride-groom's outfit, which in addition to this jacket consists of an overcoat, waistcoat, underjacket, undertrousers, leg ties, belt, boots and a hat. When worn, the off-white collar of the underjacket is clearly visible and with its diagonal, right-sided closure, it delicately contrasts with the oval neckline of the jacket. The jacket is closed in the front with two spherical buttons in gilded and enamelled metal openwork, which are decorated with longevity symbols. Korean costumes are normally tied with ribbons, buttons traditionally only being used on formal wear. Nowadays, buttons are also seen on men's, and occasionally women's, jackets and waistcoats worn on important occasions, such as weddings and birthdays. 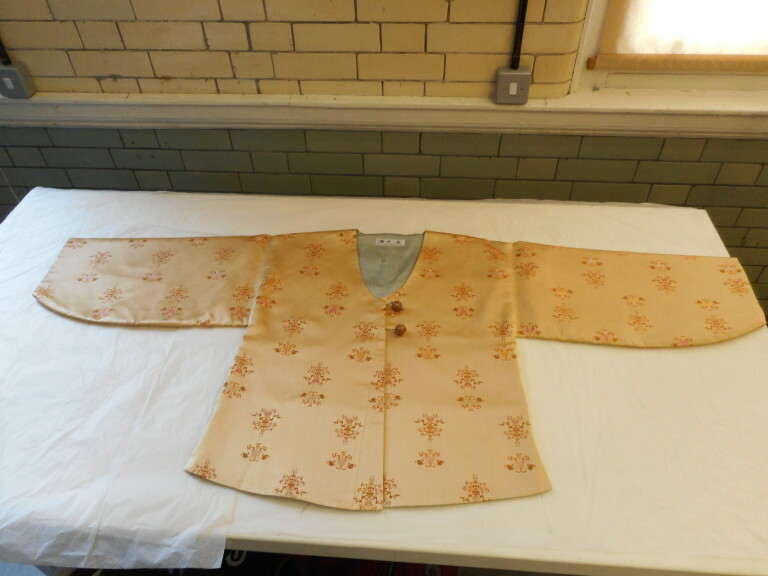 Jacket from a Korean bridegroom's outfit. 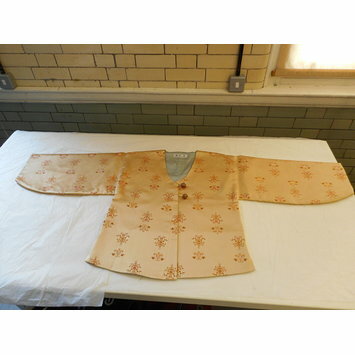 It is made of yellow silk in a repeating floral embroidered design. The lining is of grey silk with a dark grey geometric pattern interrupted by occasional larger flowers and butterflies. The jacket is secured by two spherical buttons in gilded and enamelled metal openwork, in the form of animals and birds. The buttons are attached to the jacket by twisted braid. The collar is rounded, scoop-shaped, and the sleeves are tailored wide in the upper arm; narrow at the wrist.